This type has a pulley-wheel rim and short rounded handles which have one, sometimes two, shallow furrows. There is a well-rounded body ending in a thick foot-ring base. It is sometimes stamped on the neck. Late Augustan (Tchernia, 1971) to the first half of the second century AD (Carandini & Panella, 1981). This type was made in the Guadalquivir valley of Baetica, at such sites as Hospital de las Cinco Llagas (García Vargas, 2000b) and on the coastal strip of the province, such sites as La Venta del Carmen (Bernal Casasola, 1998). 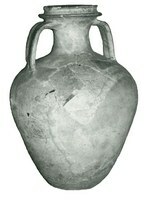 It was also manufactured in France, where a kiln producing this amphora type is known at Velaux, Bouches-du-Rhône (Tchernia and Villa, 1977). A fairly widespread distribution in the western Roman Empire, from Spain to Britain, France, Germany and Italy (Beltrán, 1970; Panella, 1970; Colls et al., 1977; Ettlinger, 1977). Unknown, perhaps wine (García Vargas, 2004).